Begins on June 20th - Bookmark it! 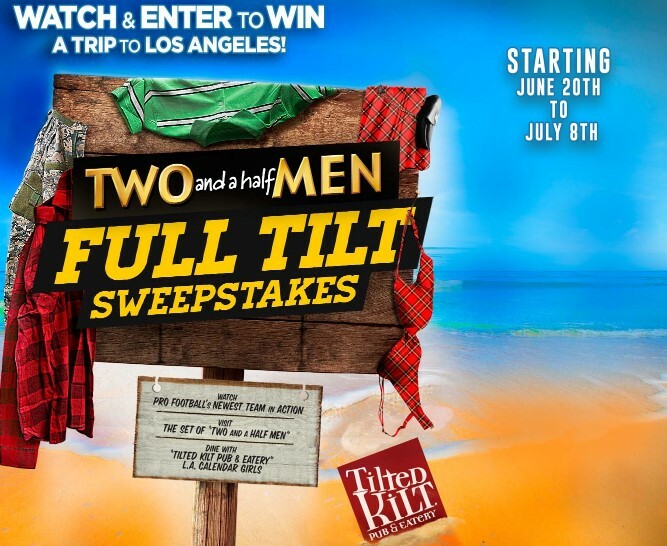 WGN is giving viewers a chance to enter daily to win a trip to Los Angeles to watch Pro Football's NEWEST TEAM in action, visit the set of Two and a Half Men and more! National Grand Prize: Three (3) National Grand Prizes awarded. National Grand Prize winners will each receive a three (3) day, two (2) night trip for winner and up to one (1) guest (“Guest”) to Los Angeles, CA (“Trip”). Trip will include round trip coach class air transportation for National Grand Prize winner and Guest from a major commercial airport near National Grand Prize winner’s home (as determined by Sponsor in its sole discretion) to Los Angeles, CA and two (2) nights accommodation (with such accommodations as determined by Sponsor in its sole discretion) in the greater Los Angeles area. The National Grand Prize winners will also each receive a Tilted Kilt gift card in the total amount of Two Hundred Dollars ($200.00), a VIP tour of the Warner Bros. Studios, a Two and a Half Men “goodie bag” (consisting of Seasons 1-12 DVD set and a Two and a Half Men Football Jersey), and two (2) tickets to the Los Angeles Rams home football game. The Approximate Retail Value (“ARV”) of each National Grand Prize is Two Thousand and Seven Hundred Dollars ($2,700.00). National Runner-Up Prizes: Fifteen (15) Tilted Kilt gift cards in the amount of Two hundred Dollars ($200.00) and Fifteen (15) Two and a Half Men “goodie bags” ($50.00) (consisting of Seasons 1-12 DVD set and a Two and a Half Men Football Jersey). ARV of National Runner-Up Prize: Two Hundred and Fifty Dollars each. Local Market Television Station Grand Prizes: Fifty Two (52) Tilted Kilt gift cards in the amount of One Hundred Dollars ($100.00) and Fifty Two (52) Two and a Half Men “goodie bags” ($50.00) (consisting of Seasons 1-12 DVD set and a Two and a Half Men Football Jersey). ARV of Local Market Grand Prize: One Hundred and Fifty Dollars each. HINT: Although you do have to enter a "Word Of The Day" to enter, on days that the show doesn't air, simply enter the word NONE as the word of the day.